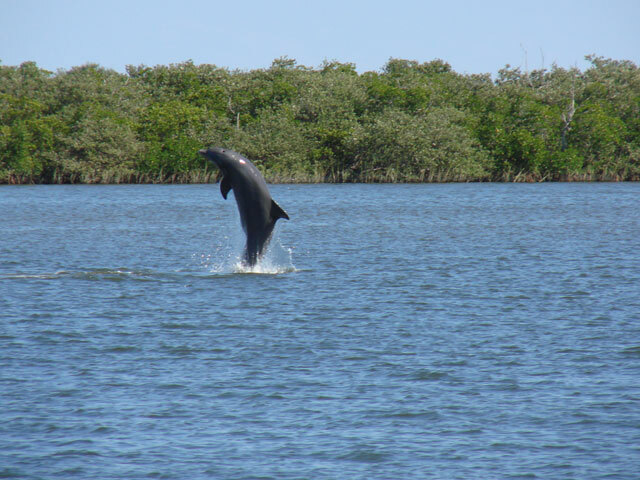 When: Thursday, April 18 2019 at 6:00 p.m.
Bottlenose Dolphins of the Indian River Lagoon will be the topic of the Marine Discovery Center’s April public lecture. Jablonski is a part of a team from HSWRI that regularly monitors the lagoon’s dolphin population. 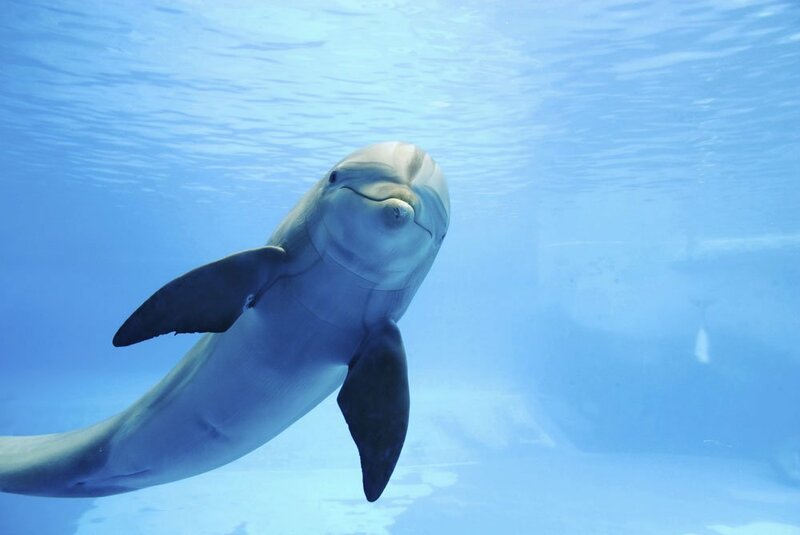 She will also provide an update on recent dolphin stranding events in which HSWRI assisted animals in the Indian River Lagoon. 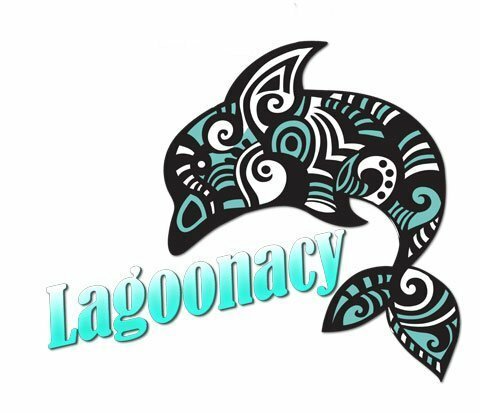 Lagoonacy, the annual fun-filled fund-raising festival for the Marine Discovery Center, will take place for the sixth year on Saturday, April 13. 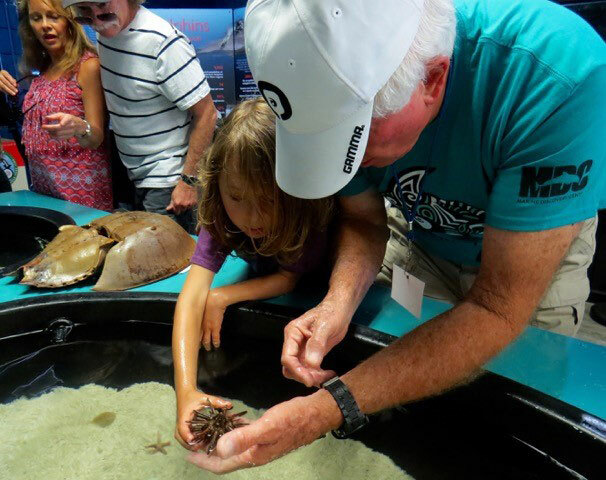 A celebration of the Indian River Lagoon, the event will once again offer a variety of activities and vendor displays for the public on the Marine Discovery Center’s campus at 520 Barracuda Boulevard in New Smyrna Beach. The event will take place from 11 a.m. to 6 p.m. Admission is $5, and free of charge for kids age 10 and under. Free on-site parking will be available. “Lagoonacy offers learning opportunities about the Indian River Lagoon for all ages and gives our guests a fun way to help support the education, conservation and restoration programs here at the center,” said Chad Truxall, MDC Executive Director. Food trucks, beer tents and live music by seven bands – including the popular Budapest String Band — will also be featured at the daylong festival. This year, performances will be held at the center’s new Hunter Amphitheater on the MDC campus. Kids age 12-under may participate in face painting or test their game-playing skills in the Conservation Carnival. Youngsters will have a chance to win toy prizes in different games for a nominal fee. 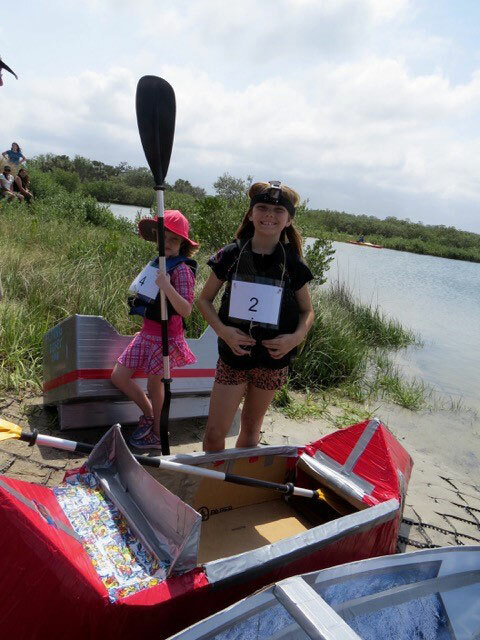 The highlight of Lagoonacy is the annual cardboard boat race, with qualifying heats of five boats starting at noon in the restored salt marsh behind the MDC building. This event encourages creativity and allows contestants to build boats using only cardboard and duct tape. Champions will be crowned in three categories: adults; teens 17 and under; and kids age 9 and under. Entry fee for the cardboard boat race is $30 for age 18 and over, and $15 for age 17-under. Each entry includes one free Lagoonacy admission ticket. Prizes will be awarded to the winners in each category, with trophies awarded to the top three finishers in each division. The adult winner will be awarded Costa sunglasses. New for the 2019 Cardboard Boat Race will be the “Most Creative Award” for cardboard boats with a lagoon theme, a “Titanic Award” for the most spectacular sinking, and the “Crowd-Favorite Award” for public appeal. All boats must be checked in and on site by 11:30 a.m. on the day of the race. A maximum of 25 boats may register per category. 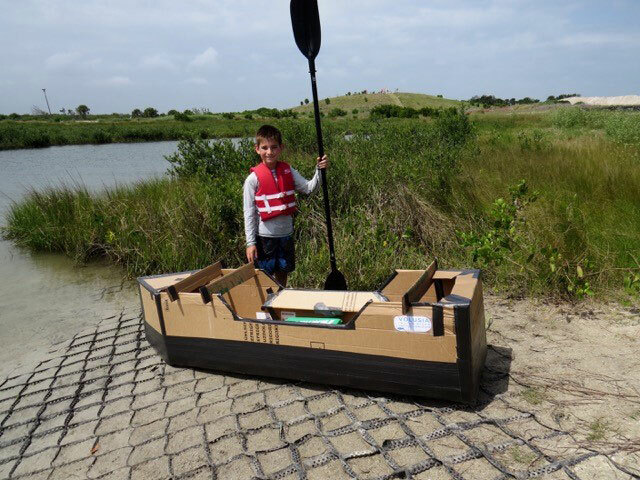 Visit Lagoonacy.org or call the Marine Discovery Center at 386-428-4828 to register for the cardboard boat and learn more about Lagoonacy 2019. 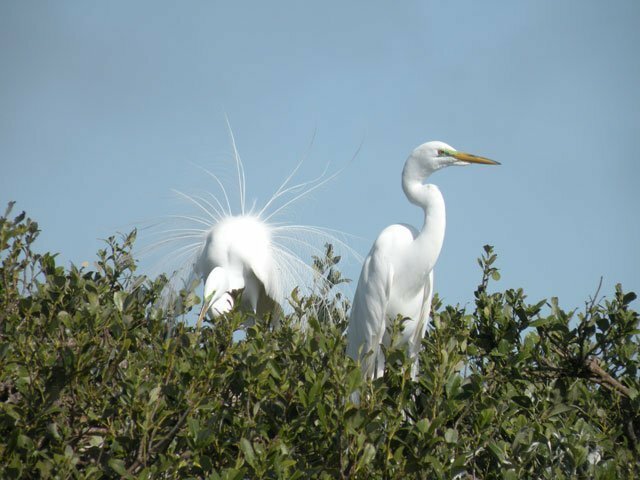 Just as it’s an annual rite of spring for the wading birds to begin displaying their breeding plumage on the rookery islands here in New Smyrna Beach, another annual occurrence is a task designed to benefit these amazing creatures. That task has become standard procedure for a number of years with humans assisting our feathered friends. The goal is to give them the best chance possible for a successful nesting season. Former Marine Discovery Center staff members Marilyn Sullivan and Mark Spradley started the February tradition of cleaning the two rookery islands of monofilament fishing line years ago. 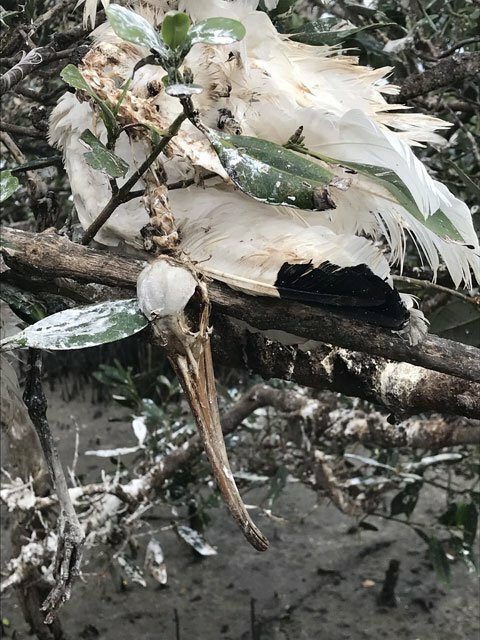 Since that time, friends, volunteers and numerous MDC staff members have pitched in to clear the islands of fishing line and old rope that could prove detrimental to the nesting birds and their chicks. 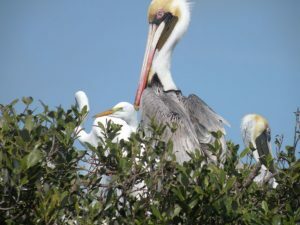 Three of us recently tackled the two islands and spent two hours climbing and slogging around under the mangrove trees in this endeavor for the 2019 nesting season. Once again, we pulled and cut fishing line with dangling hooks out of trees. And once again, we cut down four beautiful dead birds that innocently came there to perch and sadly, succumbed to human irresponsibility. 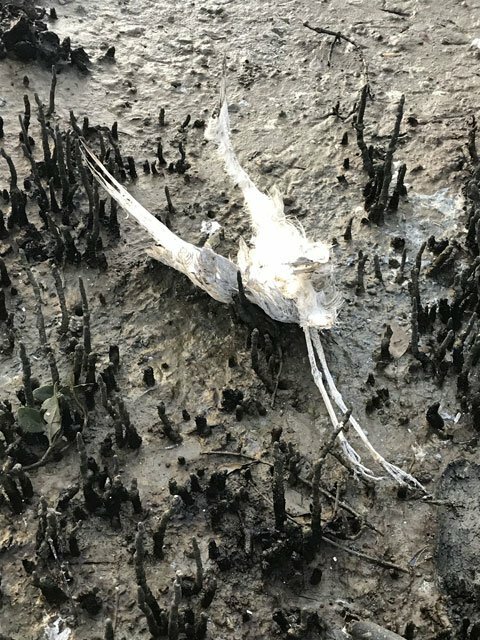 If only the snagged fishing line wrapped around the legs, wings and throats of these birds had been properly deposited in monofilament recycling tubes located at the local fishing piers. 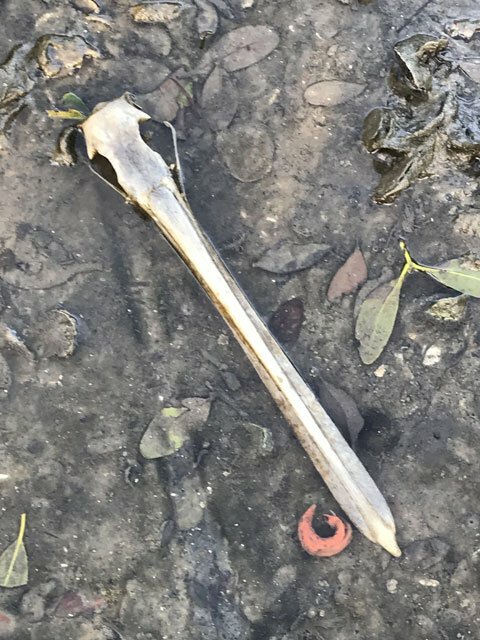 If only the recently expired juvenile pelican we cut down with the fishing hook down its throat could have been captured and taken to the veterinarians at the Marine Science Center. Perhaps it could have been saved from such a hellish end. 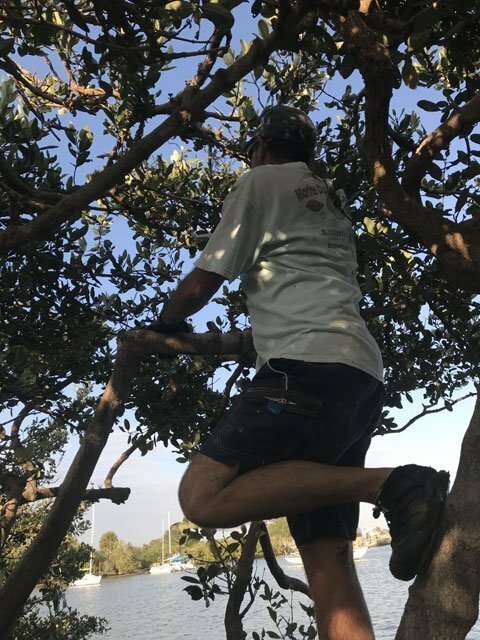 Mark climbed the trees and helped Marilyn and me reach the line my boat hook couldn’t snag. The three of us spread out across each island. Each of us snipped and cut and marveled at how even a short piece of line with a hook could be a death sentence to a bird just waiting to perpetuate the life cycle in the next breeding season. Far too often throughout the year, our naturalists and boat captains cut and pull line from these two islands. Most of us free entangled birds numerous times a year and far too often we cut down birds we didn’t see in time to save. The vultures take care of the rest. Between February and October each year, somewhere between 140-200 nests of birds spread across these two islands. Seven different species call the tangle of mangrove trees their home nursery with an average of two chicks born to each nest. Throughout the process of courtship, breeding, nest construction and laying eggs, two doting parents spend months feeding and nurturing their chicks, hoping to see them take flight into the world. That’s the real annual event — the one the birds hope to see and the one humans who care about the birds hope will happen. It’s impossible to not be moved when you clean these islands or when you are forced to pull carcasses of once-active birds out of tree limbs to remove fishing line. It’s also impossible to not be a little angry. 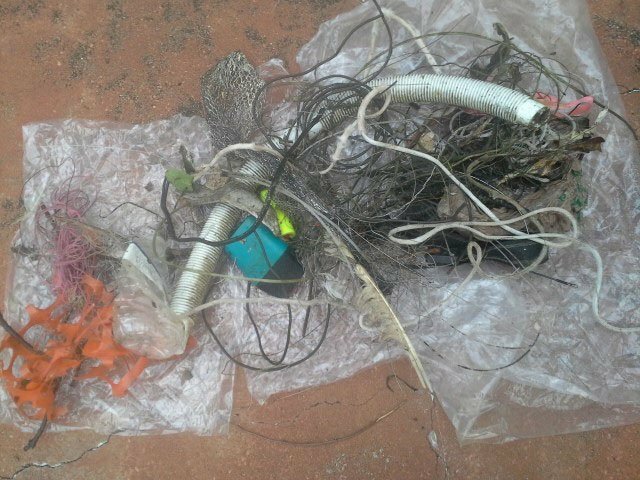 Only humans who care enough to walk to the monofilament tube and drop in old hooks and line can prevent such events. We are a growing community with many guests and many ideas about how to recreate around the water. That’s why we are all here. But these birds were here long before the rest of us flew in. It’s their home, too. The least we can do is be good neighbors. Want a fantastic chance to photograph our beautiful rookery islands during nesting season? Join MDC on our new Rookery Island Camera Cruise where our expert captains will safely maneuver the boat to view and photograph the islands from all angles. When: Thursday, March 21 2019 at 6:30 p.m.
“Living Off the Water: A Look at Florida’s Native Coastal Peoples” will be the topic of the Marine Discovery Center’s March public lecture. 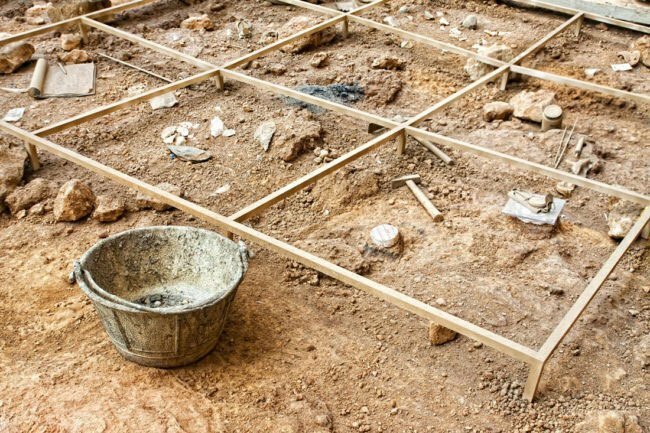 Emily Jane Murray, a public archaeologist with the Florida Public Archaeology Network in St. Augustine, Fla., will be the guest speaker for the presentation, set for Thursday, March 21, starting at 6:30 p.m. 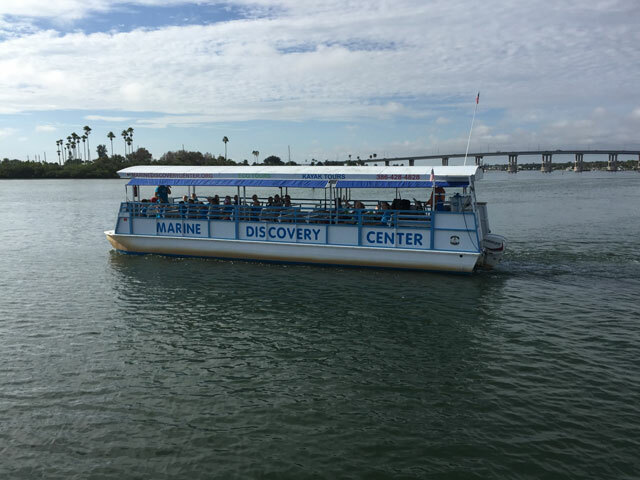 The lecture is hosted by the Marine Discovery Center, located at 520 Barracuda Boulevard in New Smyrna Beach. For more than 14,000 years, native Floridians utilized Florida’s bountiful resources for food, shelter and tools. On the coast, these native people favored estuarine and marine resources, even after the advent of agriculture. In her presentation, Murray will discuss how archaeologists have uncovered clues about the inhabitants of Florida’s northeast coast and how modern residents can benefit from knowledge of the past. Murray has worked as an archaeologist throughout the southeastern United States and has created numerous outreach tools, including videos, activities and museum displays. She currently works as a public archaeology coordinator for the Florida Public Archaeology Network’s Northeast region. She also serves on the board of the Florida Anthropological Society. Her interests include Florida’s prehistoric archaeology, historic cemeteries and public archaeology and interpretation. The March lecture is open to the public at no charge and no reservations are required. Murray’s presentation will be held in the new Hunter Amphitheater located behind the Marine Discovery Center for the official “soft-opening” of the new facility. The annual MDC members’ meeting is being held in conjunction with this event as well prior to the lecture. Some seating will be available, but guests are encouraged to bring lawn chairs or blankets for the presentation. The facility is wheelchair accessible and ADA compliant. Early arrival is recommended. The lecture will be followed by “Shadows and Reflections: Florida’s Lost People,” a short film on native coastal people. In the event of inclement weather, the presentation and film will be brought indoors at the center.